AP D Pharmacy Admission Notification 2018,Two Year Diploma course in D.Pharmacy, DTE AP Admission Notification 2018, SBTET AP Admission Notification 2018. 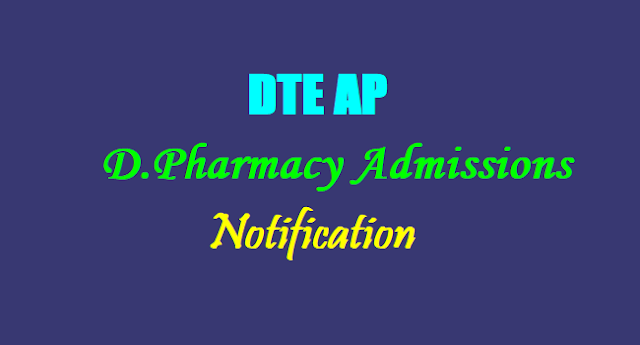 AP Diploma in Pharmacy Admission Notification 2018: Government of AP, Department of Technical Education has published the D.Pharmacy Admission 2018 Notification on 21-06-2018 for admission into 2 year Diploma in Pharmacy Course and Applications are invited from eligible candidates from the AP State for admission into two year Diploma in Pharmacy (D.Pharmacy) course offered at the institutions under the control of the Department of Technical Education, Govt. of AP. 1) Candidates should be of Indian Nationality and shall either be a Local or Non-Local candidate defined in A.P. Education Institution (Regulation of Admission) Rules, 1974. 3. Qualifications obtained from Open Schools of any State /National Open Schools under sub-regulation (5) of Regulation 5 of Education Regulations, 1991 are eligible for admission to D.Pharm course vide reference no: Ref.No.14-2/2006-PCI-5763-6337, dated 13.6.2007 of the PCI, New Delhi. As per the PCI, New Delhi circular no. 12-2/2012/PCI/52020, dt: 17-07-2012, Intermediate vocational course in MLT (Medical Lab Technician) & with or without bridge course is not an approved qualification for admission to Diploma course in Pharmacy under regulation 5 of Education Regulations, 1991 framed u/s 10 of the Pharmacy Act, 1948. The annual fee payable by the candidate admitted into D.Pharmacy course in Polytechnics/D.Pharmacy Institutions shall be Rs. 3,800/- in case of Government and Aided Polytechnics, and Rs. 17,000/- in case of Private Un-aided D.Pharmacy Institutions. However, the fee payable shall be as fixed by the Government, from time to time, and applicable at the time of admission. NOTE: The Tuition Fee is under revision of the Government and the tuition fee as notified by the Government shall be applicable, as the case may be. 1) The available seats in each Institution shall be distributed equally among MPC and BPC students. If sufficient numbers of candidates are not available in MPC stream, such seats may be filled with BPC stream candidates and vice versa. 2) Admission will be done based on the merit of marks obtained in Optional subjects of MPC or BPC out of 600 in Intermediate examination or its equivalent, as the case may be. 3) In case of candidates, who passed with CBSE, ICSE or other equivalent 10+2 years duration courses, the maximum marks should be raised/reduced to 600 in optional subjects of MPC or BPC and the total marks to 1000 (Languages + Optional) and the marks obtained by the candidates should be calculated for deciding merit. MBPC candidates of CBSE shall be considered for both BPC and MPC streams. The candidates may approach the mentioned Help-line centers (HLCs) along with a set of Xerox copies of all certificates for uploading their applications Rs 350/- is to be paid towards the cost of application(on par with the cost of POLYCET application) at HLC . The HLC officials will verify the certificates, upload the data and issue a print-out of the application. The candidates shall paste the Photograph on the application, affix signature and enclose a Demand Draft for an amount of Rs. 600/-( Rs.300/- in case of st, sc candidates) for drawn in favour of the “Secretary, SBTET, A.P., Hyderabad” payable at Vijayawada, and while enclosing a set of Xerox copies of relevant certificates, shall submit the same at the Polytechnic/Help-line centers where his/her application is uploaded. i) Marks Memo of the qualifying examination and the Pass Certificate. ii) Date of Birth Certificate (SSC Marks Memo). v) Candidate seeking reservation under Physically Handicapped category shall submit relevant certificate issued by the State and District Medical Boards, constituted by the Government. vi) Candidates seeking admission under “Children of Armed Personnel (CAP)” category shall submit the following, which are subjected to scrutiny by the Andhra Pradesh/TS Sainik Welfare Board or its nominee, and its decision is final to consider him or her for admission under “CAP” category. (a) The children of Ex-Servicemen and Servicemen residing in the State of Andhra Pradesh/TS shall submit a residence certificate signed by the M.R.O for a period of not less than 05 years. (b) The Candidate should submit a certificate of his/her parent from Zilla Sainik Welfare Office/Board with regard to the eligibility to consider him/her under CAP category (Servicemen/Ex-Servicemen) to which the applicant belongs with attested copies of the documentary evidence for claim, viz., discharge certificate, pension payment order etc. vii) Candidate claiming admission under Sports category shall submit all the relevant Games & Sports participation certificates, which are subject to verification by Sports Authority of TS/Andhra Pradesh (SAAP) or its nominee. viii) Candidate claiming admission under NCC category shall submit the relevant certificates, which are subject to verification by the Director of NCC, TS., Hyderabad or its nominee. ix) A copy of the Aadhaar Card. x) Any other document as deemed necessary by the Help-Line Centre. xi) The decision of Admission Officer in accepting the application of the candidate is final and no correspondence will be made in this regard.i) Marks Memo of the qualifying examination and the Pass Certificate. vi) Candidates seeking admission under “Children of Armed Personnel (CAP)” category shall submit the following, which are subjected to scrutiny by the Andhra Pradesh Sainik Welfare Board or its nominee, and its decision is final to consider him or her for admission under “CAP” category. (a) The children of Ex-Servicemen and Servicemen residing in the State of Andhra Pradesh shall submit a residence certificate signed by the M.R.O for a period of not less than 05 years. vii. Candidate claiming admission under Sports category shall submit all the relevant Games & Sports participation certificates, which are subject to verification by Sports Authority of Andhra Pradesh (SAAP) or its nominee. viii. Candidate claiming admission under NCC category shall submit the relevant certificates, which are subject to verification by the Director of NCC, A.P., Hyderabad or its nominee. ix. A copy of the Aadhaar Card. x. Any other document as deemed necessary by the Help-Line Centre. xi. The decision of Admission Officer in accepting the application of the candidate is final and no correspondence will be made in this regard. I want D pharmacy optional form filling dates.